Samsung A7 2018: What’s missing from the top class? The Samsung Galaxy A7 (2018) has a Triple camera Setup, an almost border-less AMOLED display, artificial intelligence and a fingerprint sensor on the side, inside the power button. Samsung itself calls it “middle class”, but what’s still missing at the top? “New perspectives in the mid-range smartphone ” the new Samsung Galaxy A7 2018 should arrive at the end of September for approximately anywhere between 45,000 PKR to 59,000 PKR in the market and will bring a triple camera setup, a fingerprint sensor integrated into the power button. In addition, a frame-less AMOLED display, artificial intelligence, and water and dust protection as per IP68. We’ll take a look at what’s missing for a top-of-the-line smartphone. What Galaxy A7 2018 Can do? Processor: 64-bit Octa-Core (2.2 GHz + 1.6 GHz), Samsung does not name the model exactly. Memory: 64 GB (can be upgraded to 512 GB) / 4 GB RAM (there should also be a version with 128 GB of memory and 6 GB of RAM). Others: Fingerprint sensor in Power button, Face Unlocking, Individual AI Functions such as Scene Optimization and Image Recognition (Bixby Vision), Waterproof and Dustproof With IP68. The equipment sounds really good for a mid-range smartphone. Especially if this is not to cost more than 46,000 Rs. For mid Range category 64 GB of memory and 4 GB of RAM are less evident, Wi-Fi connections + Hot Spot are supported, the AMOLED display is Samsung standard, but dissolves into the Full HD + screen which is very neat. The fingerprint sensor in the Power button sounds practical, also has the face unlocking of course, including a couple of pretty AI elements for better photos. What the Galaxy A7 (2018) Can’t do? On a closer inspection, a few drawbacks. For example, a modern smartphone could definitely support the new Android 9.0 (instead of 8.0). Regrettably, Samsung has not yet revealed if the cameras work together. As it was one of the killer features of the Huawei P20 Pro‘s triple cameras with a lossless 3x zoom. Whether the Galaxy A7 (2018) offers that or not, we’ll soon find out. Samsung also revealed nothing about the nature of the processor in the Galaxy A7 (2018). Rumors surfacing that it could be a Snapdragon 845, the current premier class. But that would be a sensation for the selling price, and that’s why I rather go by a much slower chipset. Samsung has also saved on the connector. It still seems to be Micro-USB 2.0, not a USB-C. Even the wireless charging support is not mentioned anywhere to charge the ample sized 3.300 mAh battery. What we do hear (not from Samsung itself) but rumors say that the camera system can record a maximum of 2K video, not 4K. And LTE? Although it is mentioned but at what speed? we’ve yet to see. Pictures released in the official press release somewhat indicate the similarities. 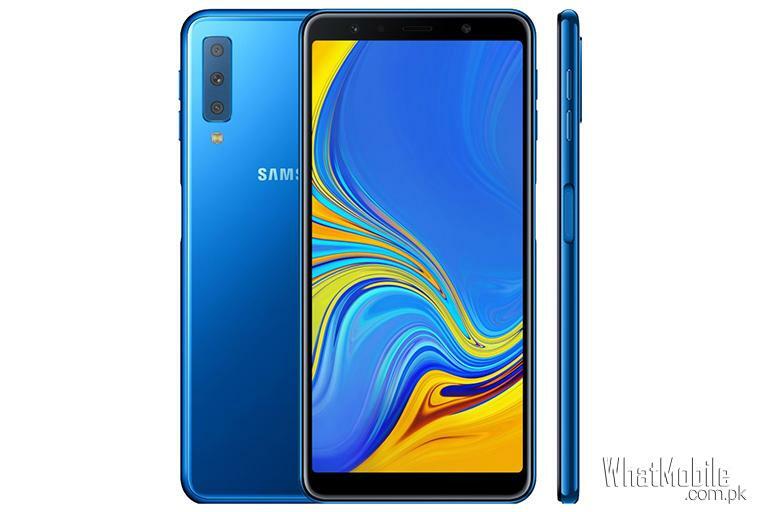 And so it is suspected that the Samsung A7 2018 would be a kind of Lite version of the recently introduced Galaxy Note 9 . Samsung could go the same way as Huawei did with its Lite smartphones. The respective top model is, of course, better equipped, but the Lite version gets a special function. The Galaxy A7 (2018) has a three-lens camera setup and the Galaxy Note 9 has only two. 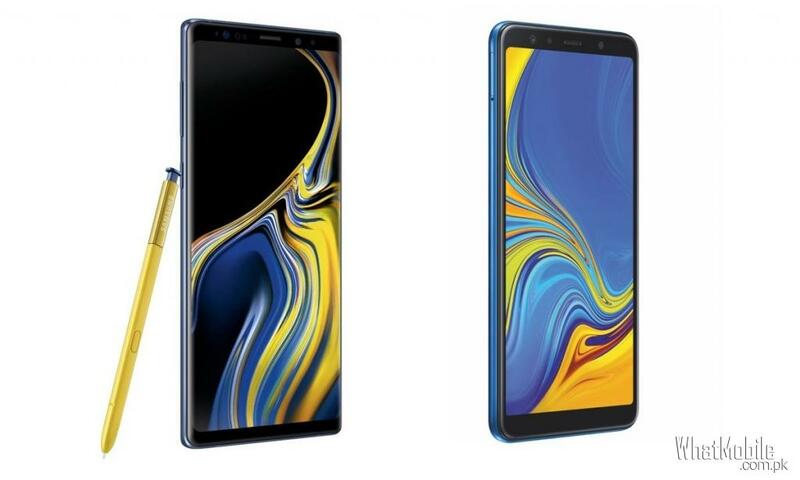 Otherwise, the almost Two times as expensive flagship wins against the Galaxy A7 of course: higher resolution, more battery, more memory, a newly designed S-Pen, a pretty revolutionary water-carbon cooling system, wireless charging and – most likely – A faster processor. 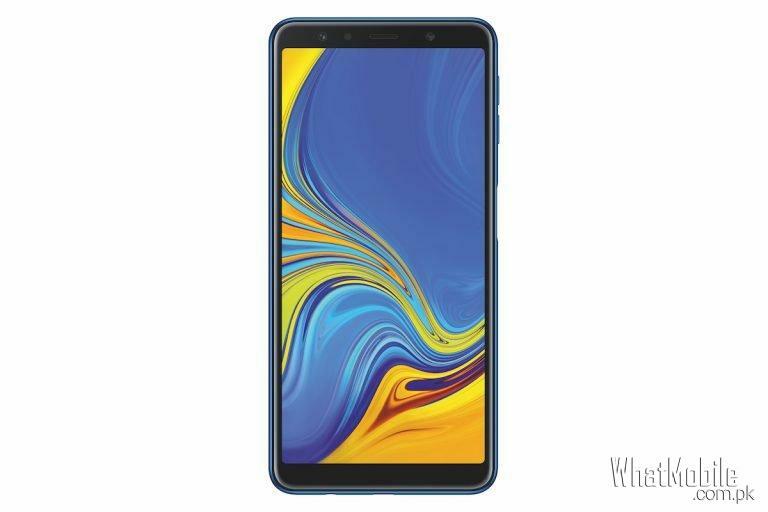 The Samsung Galaxy A7 (2018) feels like a lighter version of the Samsung Galaxy Note 9. It will have a slower processor, a less-valued-looking case and all in all, even the camera might not shoot as good photos. However, Samsung has not only trimmed it down but have also added many extras. With 128GB / 4GB finally a satisfying memory for a mid-range device, a fingerprint sensor on the side in Power button, additional face unlocking, a high enough resolution display, water, and dust protection according to IP68 Rating. You cant find these in any other mid-range device, apart from the missing 4K video and the micro-USB, if Galaxy A7 2018 is launched under 49,999 PKR, it would be a solid bang for your bucks, anything beyond that won’t be a good bargain!